Protect your favorite tomato, cucumber, and blueberry plants from animal pests by surrounding them with the Gardman Black Medium Fruit Cage. 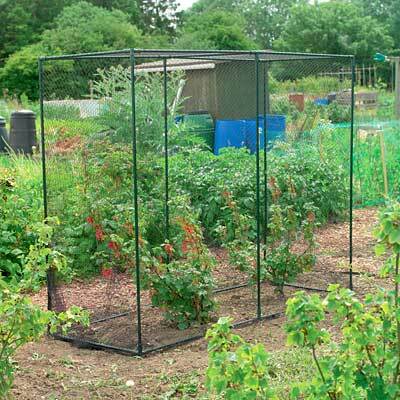 This wonderful frame and netting perfectly protect your small to medium crop, stopping birds, deer, and rabbits from dining on the fruit. The tubular steel frame has push-fit joints for easy assembly without tools, and its powder coated finish prevents rust. Stretch the included netting around this frame, and secure the assembly to your soil using the included ground pegs. This net allows water, air, and sunlight to reach the crops, while its 1.25" long openings keep animals away. Included zip ties keep the net secured to the frame, and the item may be removed and disassembled at the end of each season for storage. Its 63" height handily covers medium bushes or crops, while offering plenty of growing room. Keep the fruits and vegetables you have grown protected from wildlife with this Black Medium Fruit Cage. Assembly required.